In December 2016 Aspen Institute Romania celebrates its tenth year of activity. We mark a decade in our common quest for a “Good Society”, during the sixth edition of the Aspen Institute Romania Leadership Awards and Gala Dinner, taking place in Bucharest, on December 12, at The National Museum of Art Romania (MNAR) – The Throne Hall. You may find photos of the event on our Flicker account. We will celebrate ten years of activity and the result of the effort and dedication of a visionary community. The AIR founders and team were tenacious enough to establish, build and carefully support through the years the embodiment of the Aspen Idea in Romania. The historical venue of the Royal Palace will offer the space for launching the newest program of the Institute – following the same line of values-based leadership. AIR and MNAR are laying the foundations of the Arts and Society Program, a platform aiming at promoting the humanities as an instrument for social progress and providing the adequate tools to acquire applied knowledge in the field of arts. The program will be co-chaired by Mrs. Jenny Taubman, founder of the Taubman Museum of Art and supporter of activities promoting art and dialogue in the USA and Romania and Mr. Calin Stegerean, Director of the National Museum of Art, Romania. Already a treasured tradition, the Aspen Romania Gala represents the opportunity for the thriving and growing Aspen community to reunite and revisit its shared values and interests. A pleasant night among friends, a celebration of values-based leadership, innovation and excellence, the event aims to allow all of our guests a moment of reflection on what is the added value of our community. The Aspen Gala also offers Aspen Young Leaders and Aspen Fellows the opportunity to present their accomplishments in the past year and to reaffirm their ambition of producing a significant impact on societies across Central and Eastern Europe. The Gala is a fundraising event and throughout time, our patrons, partners and sponsors played a critical role in helping us grow and expand our area of impact. Thanks to their generous contributions we organized throughout the years, in partnership with youth organizations, several successful editions of the Aspen Junior Seminar, program attended by more than 80 promising students and young professionals. Also, we were able to secure, by offering full scholarships, the public and not for profit sectors representation in the Institute’s most significant program, the Aspen Seminar for Leaders. During this year’s Gala, we will continue a treasured initiative launched at the previous edition of the Aspen Gala, the Aspen Social Action Prize. Through this distinction we would like to offer recognition and a symbolic financial support to a social project developed by a member of the Aspen Fellows Network, to be chosen by the vote of the Aspen Community. Mr. Gunther Krichbaum studied law in Tübingen, Lausanne, Geneva and Heidelberg. After his practical legal training at Heidelberg regional court, he worked as a self-employed economic consultant. Mr. Krichbaum joined the Christian Democratic Union (CDU) in 1983. Since 2002, he is a directly elected member of the German Bundestag, representing the Pforzheim/Enzkreis constituency. He was re-elected in 2005, 2009 and 2013 (with a 49,5% share of the vote). Since 2007, Mr. Krichbaum has been the Chairman of the Bundestag’s EU-Affairs Committee. Between 2002 and 2007, Mr. Krichbaum was a regular member of the EU-Affairs Committee and rapporteur for Romania. In 2010, he was awarded with the title Commander of the Order of the Star of Romania (Steaua României). He is also a member of the Board of the German-Romanian Association Pforzheim. The Romanian women’s national handball team is one of the most prolific sports team in the history of Romania, being regarded as one of the most spirited competitors in handball. Being the only team in the world to contend at all the World Championships, Romania has managed to reach the final stages at the foremost international competitions, such as playing in the semifinals and obtaining the 3rd Place at the World Championship in 2015 and reaching the final in 2005, placing 2nd. The team is regarded by the people in Romania as a model of resilience, hard-work and willingness to constantly push the boundaries previously set by themselves. Their sheer determination and public display of leadership has managed to inspire children to start playing handball, as well as adults to yet-again cheer for Romania and commit their support for the roster. The 2016 Sports and Society Leadership Award is presented by Raiffeisen Bank. Cornel Amariei is a Romanian born Inventor, Author and Entrepreneur, most widely known for inventing .lumen, a blind assisting device which partially restores the vision of visually impaired individuals. He is a graduate of Jacobs University in Bremen, Germany, the author of the Arduino Development Cookbook. He is a R&D professional, currently holding the Innovation Manager position at a leading automotive component manufacturer. In his spare time, Mr. Amariei is also a musician, playing several instruments, predominantly guitar, a world traveler and a trainee pilot. The 2016 Innovation and Technology Leadership Award is presented by ExxonMobil Romania. Attila Kim, born in 1977, is an architect with extensive experience in architectural design, exhibition architecture, cultural event design and restoration. Attila Kim’s professional performance was recognized by multiple national awards at the National Architecture Biennale and Transylvania Architecture Biennale (11 awards and 5 nominations), and international awards, being nominated three times for the European Union Prize for Contemporary Architecture – Mies van der Rohe Award (2009, 2011, 2017), and for the Iacov Chernikhov contemporary architecture award. He studied architecture at the Technical University of Cluj Napoca and received several study grants in Slovakia, the USA, and The Netherlands. After obtaining his certificate in architecture, he continued his studies with an MA in the Rehabilitation of Historical Monuments from the Babeș Bolyai University of Cluj Napoca, and a Doctorate in Liberal Arts from the University of Art Moholy Nagy in Budapest, followed by Stefan Odobleja research grant from Bucharest’s New Europe College. Attila Kim is the Commissioner for Romania’s participantion at the International Architecture Exhibition La Biennale di Venezia 2016 and at the International Art Exhibition La Bienalle di Venezia 2017. The 2016 Arts and Society Leadership Award is presented by UniCredit Bank. Colonel Cătălin Ticulescu has graduated from ”Mihai Viteazul” Military High School in 1988 and in the same year he joined the Infantry Officers School ”Nicolae Bălcescu” in Sibiu. In 1999 captain Ticulescu was appointed as Chief of S-2 Intel for 341th Infantry Battalion, part of the multinational South-East European Brigade (SEEBRIG), where he served for five years. During this period, from March 2003 to May 2004 he deployed with the OSCE in Georgia, where initial he served as military observer and later on as Personal Assistant to the Head of OSCE Border Monitoring Operation in Georgia. In December 2004 he graduated from the Brigade Staff Officers Course in Romania. In 2005 major Ticulescu was assigned as staff officer in G-2/1st Territorial Army Corps. He served in this position for two years. Along this period, he was deployed in Kandahar, Afghanistan as Liaison Officer/ 341th Infantry Battalion “White Sharks”. On 31st of March 2006 he was wounded during a patrol mission in Kandahar province. After about 3 weeks spent in Ramstein Military Hospital, Germany, partially recovered, he requested and was approved to return to his unit in Afghanistan and completed his tour of duty. For his activity in Afghanistan, in June 2006 he was decorated by the Romanian President with ”Virtutea Militara” Order in the rank of Commander. In 2007 he was selected as Personal Assistant to the Romanian CHOD. He served in this position for four years. In 2009 he went to US Army Command and General Staff College in Fort Leavenworth, KS. He graduated in 2010 and he gained an MMAS from CGSC. He was promoted lieutenant colonel in 2009. From 2011 to 2014 he was posted as Operations and Crisis Response Officer to the Romanian Military Representation to NATO and EU in Brussels, Belgium. Throughout his tour there, he was directly involved in all Military Committees Working Groups related to NATO operations, as well as in the Working Groups which dealt with Contingency Planning. In September 2014 lieutenant colonel Ticulescu completed his tour in Brussels. Returning to Romania, he was appointed as Commander of 495th Infantry Battalion. He was promoted to colonel in December 2014. Since June 2015 he is the Commander of Romanian NATO Force Integration Unit (NFIU ROU) in Bucharest. The 2016 Service with Dignity Leadership Award is presented by Mr. and Mrs. Vasile Iuga. Ioana Moldovan is a freelance photojournalist, documentary photographer and writer. She has documented subjects from Ukraine to Ethiopia and the Middle East, telling people’s stories and trying to raise awareness on social and human rights issues that no one is entitled to forget. Her photos have been showcased worldwide: published on international and local magazines, illustrated books, shown in theatre shows; have been the object of numerous exhibitions and awarded in several contests. Ioana Moldovan was one of the ten Eastern-European photographers selected for a Masterclass in Documentary Photography by the Dutch NOOR Photo Agency. 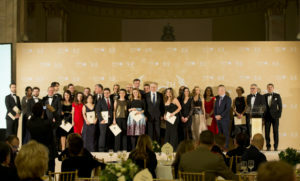 In 2016 the U.S. Embassy in Bucharest presented her with the “Women of courage” award for outstanding achievement in highlighting truth through photojournalism. At the Eddie Adams Workshop 2016, where she was selected to participate, Moldovan was awarded the Bill Eppridge Memorial Award for excellence and truth in photographic journalism. Andrei Pungovschi is a freelance photojournalist, working for DOR magazine and Agence France Presse, as well as other publications. After graduating from journalism school, he went on to study photojournalism at the University of Missouri in the United States on a Fulbright scholarship. From 2005 to 2010 he was a staff photographer for Mediafax news agency in Bucharest. Values Based Leadership: Mr. Octavian Morariu, President, Romanian Olympic and Sports Committee. Service with Dignity: Mr. Ionut Dan Cristea, Ensign/Chief Engineer, Fast Response Cutter, Ministry of Administration and Interior (the only Romanian to have graduated from the US Coast Guard Academy). Focus on Tomorrow’s Leaders: Grassroots Innovation and Entrepreneurship: Mr. Corneliu Birtok Baneasa, Inventor of the Universal Super-absorbing air filter. “Rică Georgescu” Values Based Leadership: Mr. Craig Kennedy, President, German Marshal Fund of the United States. The Aspen Institute Romania propose a series of debates, events and papers meant to bring perspectives from and on the region into the preparations of Council Presidencies and the broader European conversation. This paper presents an original novel metric for assessing economic activity at local level: Local Business Environment Index (LBEI).